Pentax overview of the Pentax K-m model: "Designed primarily for beginning digital SLR photographers, this new entry-class model offers simplified, user-friendly operation, and an easy-to-maneuver compact, lightweight body. 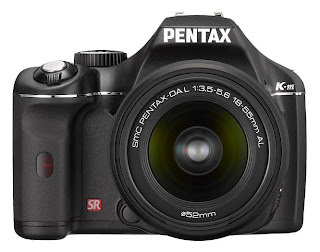 The PENTAX K-m was developed as an entry-class digital SLR camera offering simple, straightforward operation, making it possible for first-time digital SLR users and family photographers to enjoy high-quality digital SLR photography with little trouble or confusion." An Easy-to-Operate, Entry-Class Digital SLR Camera Featuring Shake Reduction, Scene-Specific Shooting Modes and an Array of User-Friendly Functions in a Compact, Lightweight Body. HOYA CORPORATION PENTAX Imaging Systems Division is pleased to announce the launch of the PENTAX K-m digital SLR camera. Designed primarily for beginning digital SLR photographers, this new entry-class model offers simplified, user-friendly operation, and an easy-to-maneuver compact, lightweight body. The PENTAX K-m was developed as an entry-class digital SLR camera offering simple, straightforward operation, making it possible for first-time digital SLR users and family photographers to enjoy high-quality digital SLR photography with little trouble or confusion. It features an upgraded version of the PENTAX-original Auto Picture mode, which automatically detects the type of subject or scene, and sets the proper shooting mode for the photographer. It also features a host of advanced features and sophisticated functions — including the innovative in-body Shake Reduction mechanism — to assist the photographer. It also offers a compact, lightweight body, designed by incorporating PENTAX’s advanced downsizing technologies, accumulated over the years of digital SLR development, into different body parts. As a result, the PENTAX K-m assures simple operation and outstanding operability, even for inexperienced first-time digital SLR users. Along with the PENTAX K-m, PENTAX will also launch two DA L-series interchangeable zoom lenses: the smc PENTAX-DA L 18-55mmF3.5-5.6AL and the smc PENTAX-DA L 50-200mmF4-5.6ED. Designed for exclusive use with PENTAX digital SLR cameras, these DA L-series lenses are designed to be more compact and lightweight than conventional counterparts, without sacrificing any of the exceptional optical performance common to all PENTAX lenses. The PENTAX K-m features a newly designed control system, which positions most of buttons and levers on the camera’s grip side, making it easier for first-time digital SLR users stepping up from their compact models to operate the camera. What’s more, the functions of each button or lever are instantly displayed on the camera’s LCD monitor with a single press of the help button to facilitate camera operation — especially for those who are unfamiliar with digital SLR cameras. The PENTAX K-m comes equipped with the PENTAX-developed SR (Shake Reduction) mechanism, which effectively reduces camera shake for sharp, blur-free images even under demanding shooting conditions — such as when using a telephoto lens, shooting in the dark or at night without supplementary flash illumination, or using extended exposures for sunset scenes. This innovative SR mechanism shifts the position of the image sensor vertically and horizontally at high speed using magnetic force, while adjusting the shifting speed in proportion to the amount of camera shake detected by a built-in sensor. It offers an outstanding compensation effect — up to the equivalent of approximately four shutter steps. As a result, it does not require special anti-shake lenses, and can be used with almost all existing PENTAX interchangeable lenses. The PENTAX K-m incorporates a five-point wide-area AF system (SAFOX VIII with five cross-type sensors) to assure dependable, high-precision autofocusing. Using the five sensors positioned in a cross pattern over the image field (one in the middle, two at sides, and two at top and bottom), this system automatically and unfailingly selects the optimum sensor for a given subject. It also allows the user to fix the AF detection point at the middle sensor. Thanks to a thorough review of the AF algorithm, this AF system also offers improved autofocusing speed under poor-lighting conditions, in which conventional AF systems take longer to focus on the subject. The PENTAX K-m’s auto sensitivity control function automatically sets the optimum sensitivity between ISO 100 and ISO 3200, based on such data as the subject’s brightness level and the lens’ focal length. Since this function allows the user to take advantage of faster shutter speeds in poor lighting situations (such as indoor sports events and nighttime scenes), it helps the photographer to effectively reduce camera shake and subject shake and prevent blurred images. The PENTAX K-m’s dynamic-range expansion function allows the user to expand a dynamic range (or a range of gradation reproduction) to minimize white-washed areas in the image. On the other hand, its shadow compensation function minimizes pitch-black areas lacking details. Combined, they help the user to produce beautiful, rich-gradation images when shooting high-contrast subjects. Very nice camera! I am thinking of getting a top rated DSLR camera and I can't decide what to get between Nikon and Canon... But this Pentax K-m looks great as well. Hope I won't regret my purchase! Thanks! If an emergency takes places, it really makes you distressed if you don't have the readied cash to handle the situation. Consequent to your simply other alternative for getting fast cash is asking for it from partners and relatives, your simply suitable decision is to secure the money. Wow it is really amazing,this is best application i had ever seen,apps stuff is mindblowing. tiến độ xây nhà mẫu Five Star Kim Giang | Tiện ích vàng C1 C2 Xuân đỉnh | sieu to hop cao cap Nhà mẫu Chung cư N01 t1 Ngoại Giao Đoàn | phòng bán hàng công bố Giá bán Chung cư 283 Khương Trung | The Link Ciputra | Bao gồm 4 tòa nhà cao 40 tầng Chung cư Bắc Hà Tower Chung cư C37 Bộ công an. | Tổng cộng có 440 căn hộ tại Sapphire Palace. | VÀ cả khu thấp tầng với 100 căn hộ có Mỹ sơn Tower Chung cư 62 Nguyễn Huy tưởng . | Nếu có thời gian hãy tới trung tâm thành phố hà nội để xem dự án có CT1A nghĩa đô. | Nơi đây còn có cả nhiều tiện ích cực khủng như trường học Eco City. | Chuẩn bị bàn giao nhà những dự án có Riverside garden 45 vũ tong phan. Each and everyone loves to watch the live NHL matches. Hence, you cam watch all the NHL matches live on 720p stream.me nhl android apk. In addition to that you can also watch them on http://sportsarefree.xyz nhl 2018.
thanks for your article Togel Online wull support you.